With all the crazy hen party activities floating around, sometimes it’s nice to just relax and enjoy the company of your friends and family with a fun event. If this sounds right for you, why not enjoy a bowling and drinks hen party in the unique bar setting. In the heart of Manchester, this hen party activity is a laid back way to celebrate in the evening, and gets everyone involved! Head over to Manchester city centre, where the nightlife is booming and the cocktails are renowned for being delicious. 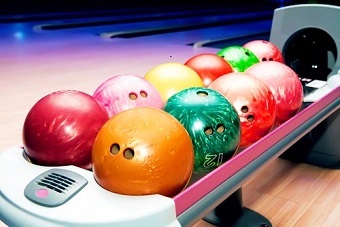 When you arrive, grab your bowling shoes and lace up for a bit of friendly competition between your hen group, even bring some prizes or forfeit sheets to spice up the hilarious experience and make it one to remember. Once you arrive, get stuck in straight away with adding your names (or funny nicknames) to the boards and get bowling. This hen do experience includes one full round of bowling in your exclusive lane, but feel free to add a couple more games and hours to really make your hen party one to remember! With the full sized bowling alleys being placed in a bar, you get the luxury of the nightlife atmosphere while relaxing with this fun and laid back hen party activity. To add to the party atmosphere, there will be a complimentary drink for everyone in your group whether they fancy a glass of wine, pint of beer or cider, or even a spirit and mixer to get the party started. You can really make this bowling and drinks hen party idea your own, and with the venue being in the city centre and open til’ late you can carry on your night in one of Manchester’s nearby nightclubs and celebrate until the early hours! Bowling and a few drinks is a great, light hearted start to any night where everyone can get involved no matter what their age, or as a great end to an exciting and celebratory hen party day. Want a totally chilled Manchester Bowling & Drinks hen party? If so, let our events planners give you any more information you need, or simply organise the whole event for you and give us a call on 0161 341 0052.